The unfortunate reality is that large truck accidents constantly happen, as hundreds of thousands are estimated to occur each year. Truck driving is a difficult profession, mainly because there’s a lot of concentration involved along with lengthy hours. However, it’s also a crucial job, because the delivery of goods is essential to businesses across the country. 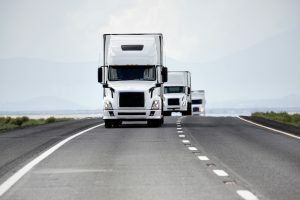 The unfortunate reality is that large truck accidents constantly happen, as hundreds of thousands are estimated to occur each year. It can be a dangerous job to undertake, but there a plenty of ways to turn this dangerous job into a safe environment. When you’re driving a large truck, it’s hard to be aware of everything around you. You don’t have the luxury of a rear-view window, and your areas of visibility are limited. The worst spots for truck drivers are located to the side in front of the cab, slightly behind the mirrors, and directly behind the truck. These are virtually dead zones. As a truck driver, you need to always move with caution when changing lanes. On the road, we have a wide variety of speed limits for different situations, but truck drivers should stay a bit below these limits. It’s a matter of safety, and it’ll help you when you go to make turns. If you’re struggling with turns, there are a few rules to keep in mind. The first is that you should always signal well before the actual turn. This gives other drivers enough time to maneuver accordingly, and it also makes things easier for you. Be aware of how far the truck swings out, as this obviously impacts other drivers. Be sure to constantly check your mirrors. It seems standard, but some truck drivers will be careless with this aspect. If you’re transporting a large amount of freight, you need to be smart about how it’s packed into the truck. The higher it’s stacked, the tougher it becomes to accurately drive. The lower you stack the cargo and space it out, the easier it will be for you to drive through on a long trip. The weather always plays a crucial role in how we drive, as it’s one of the biggest causes of accidents. As a constant theme with truck driving, it’s incredibly important to drive slow. Driving slow gives you more time to react, and it’ll also help the other drivers on the road. Especially if the road is slick, you can’t take the risk of driving fast. This entry was posted on Friday, October 20th, 2017	at 6:40 pm	and is filed under Trucking Basics	. You can follow any responses to this entry through the RSS 2.0	feed. Both comments and pings are currently closed.